Björk’s late-career renaissance was born out of great personal sadness and loss. The veteran Icelandic songwriter’s last release, Vulnicura, was a heartbreaking look at her disintegrating relationship with artist Matthew Barney, a very public document of her strife laid bare without even a morsel of self-pity. It was a tough listen, and it’s still hard to listen to. But it left one expectant about Bjork’s next move, one that would certainly address the possibility of healing. The meaning of utopia is designed to simplify a feeling. A quick glance at the album’s title would create the assumption that Björk is either blissfully unaware or willfully unconcerned with past events. Much of Utopia, her tenth full-length, lies somewhere in the middle - she’s certainly open to the idea of affection on Arising the Senses, a liberating account where she triggers her own sexual urges over an apt display of beatific synths and her iconic cello arrangements: "Every cell in my body / lined up for you / legs a little open / once again.” It seizes the listener with a giddiness that charms, but most importantly, it makes you root for her if you’re aware of her personal accounts. Utopia’s idyllic voyage eases Björk triumphantly out of Vulnicura’s thorny darkness, where endurance is a necessary attitude that is central to her patient story arc. The elegant orchestrations she develops are oftentimes rewarding, even if they gloriously highlight some of her nagging indulgences. A great portion of The Gate, for instance, is spent on superfluous vocal manipulations and splintering textures that don’t really cohere once the song’s rousing, though fleeting, chorus comes along. But set aside those more atonal compositions stand minimal breakthroughs like Features Creatures, a haunting depiction of mistaken identity that’s practically built around her exquisite timbre; fittingly, it does put an emphasis on voice much like 2004’s Medúlla. Given how Utopia runs for a strenuous 71 minutes, it’s sometimes a bit of a struggle to better appreciate Björk’s generous offering. Her views on love unfurl like a classical suite with a hint of theatricality, though the ambient scope she works with can bring about some uneven results. Even when heavily ornamented with a profusion of flutes, courtesy of the Icelandic Hamrahlid Choir, the busy, jungle-like tempo of Courtship does provide some liveliness to the album’s otherwise narcoleptic mood. Much of the album relies on ambiance to layer her emotions - she cautiously advises about the importance of humility from the point of view of a mother on Tabula Rasa (“My deepest wish / Is that you’re immersed in grace and dignity”), utilizing a concise, glimmering arrangement that is unfairly spoiled considering the rest of the album’s beautifully empty detours. These show-stopping moments are few and far between in Utopia. There’s such an emphasis on its virtuosic instrumental attributes that it initially distracts from the album’s lyrical themes, even if she still knows how to write a chorus that sounds markedly grandiose when taken under any context. It’s not so much of a gamble to place such an emphasis on words, as you can go back as far as Post’s Hyperballad to unearth her romantic pursuits. But here they’re mostly absent, as she prefers to get lost on poetic reminiscences: Blissing Me, for example, disorients with its heavenly arpeggios, where an infatuated Björk gushes about a blossoming kinship that strengthens through the power of music ("Is this excess a texting in blessing? Two music nerds obsessing"). These drunkenly beautiful moments share parallels with Vespertine, an album filled with quiet, subtle beats that also found her evaluating and experiencing a newfound desire to explore her identity. Utopia does function as a companion piece to Vulnicura, if only because it doesn’t require much effort to separate them as contrary forces. 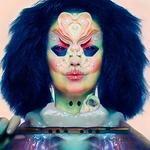 But this is Björk’s way of sending a fond farewell to the past, as she undergoes some changes with a positive embrace. An ecclesiastical organ paves the way for a brighter future on album closer Future Forever, a soothing ending that ultimately celebrates the act of love itself rather than her own. “Hold fort for love forever / we’re just momentary vessels / we’re just carrying,” she intones with assuredness, a graceful way to end a troubling monologue that is still taking place.